Racer-X Bags For PowerBook 15" and 17"
Mobility Electronics, Inc. has announced its new Juice power adapter's support for the Apple platform, expanding the company's footprint in the mobile computing industry and offering Mac users a powerful complement to their PowerBook and iBook computers. Juice is the first and only product that enables users to simultaneously charge their laptop and a mobile phone or handheld from any power source - standard wall outlet, auto outlet or airline outlet - allowing mobile Mac users to carry a single power device for all their laptop, mobile phone, and handheld device power and charging needs. Juice's sleek, silver package combined with its all-in-one functionality makes the product appealing to Mac users who appreciate Apple's signature design and world-class performance. Mac users depend on their iBooks and PowerBooks to provide maximum functionality in a compact package, ensuring they have access to the tools they need wherever they go. Juice's powerful functionality allows Apple users to stay powered up whether at the office, on the road or in the air, while its compact design lets them maintain the mobility their lightweight iBooks and PowerBooks afford them. "Apple users represent a significant portion of the most sophisticated and innovative mobile computing consumers," said Charlie Mollo, CEO of Mobility Electronics. "We are happy to reach this critical audience by working with Apple, and expect this program to play a key factor in achieving our goals for the power product category. "We expect Juice to be a hit with iBook and PowerBook owners looking for a power adapter that will make their mobile computing experience easier and their bag lighter," he continued. Beginning in March, Juice will be available through the online Apple Store, at Apple Retail Stores, and through select Apple Authorized Resellers for the suggested retail price of $119.99. In addition, Juice is also available toll-free (1-800-DIAL-IGO), on iGo's website, and through major U.S. computer hardware retailers, leading distributors, and resellers who carry Apple products nationwide. See everything, in total darkness, with both hands free. The eyelighter is one of the coolest must-have gadgets to come around in a while. Looking like it came straight out of Star Trek, this overdriven, super-bright LED lighting module is attached to a secure positional ear clip allowing this minuscule, 10 gram unit to completely illuminate your field of vision. Much more useful for computing than the USB flexy lights in use today, the eyelighter illuminates anything and everything you look at, not just a portion of the keyboard. The unit is battery powered and will illuminate for over 40 continuous hours. It will last for months when used for 2-3 hours per day. The unit features squeeze-to-light and an on/off switch for the ultimate in convenience. Great for astronomers, photographers, mechanics, engineers, electricians, plumbers, backpackers, campers, law enforcement, and others. eyelighters are available in three illumination colors: bright white, bright blue, and red. Blue and red are perfect when dark vision needs to be maintained. Affixes to right ear; compatible with eyeglasses. Phenomenal brightness from a 10 gram unit. Adjustable, very secure ear clip. Will stay in place even while running or jumping. Inexpensive enough to simply replace. Virtually indestructible, unbreakable LED "bulb". Thousands of uses. When you just need your PowerBook and a few accessories, throw the Racer-X on your shoulder and head out. 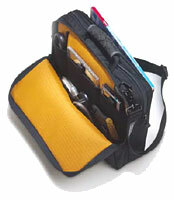 This tough compact case with a plush interior and a Mountain Bike Grip protects your laptop from life's hard knocks. Designed for the Apple PowerBooks 15" & 17"
15" PowerBook dimensions = 14.5" x 11" x 4"
17" PowerBook dimensions = 16.5" x 11.6" x 4.5"
The Jacques Pack has been specifically designed to maximize the protection of your Titanium and to compactly carry the accessories that are a part of your working system. It is extremely comfortable, stylish, and discreet. elegant design - at home on the road and acceptable in the boardroom in its briefcase form. additional protection ensured by internal TiBook compartment corrugated dividers sandwiched to a "gushy" foam padding to isolate the TiBook from the external pack walls. easy storage of cables, and some accessories with a convenient Velcro secured, fold-down accessory divider /pocket system in the laptop compartment. additional storage for the power supply and other accessories by a removable, mesh topped zippered pocket located in the upper section of the paperwork compartment. extreme carrying comfort with contoured, padded shoulder straps which are quadruple layered at the back panel connection line for extreme durability. removable sternum strap for increased stability and comfort as well as a removable waist belt for shifting your load to the hips and legs. room in the paperwork compartment for a eight centimeter (2.5") depth of letter sized file folders or other items plus a centimeter (0.5") of legal sized file folders. new easy access cellphone pocket which can be attached securely to either of the two shoulder straps. (A second pocket for sunglasses or other items can be ordered for an extra $15 Cdn ($10 US). "Nvidia Corp. and ATI Technologies moved further ahead in the mobile graphics space, adapting their desktop graphics cores for use in notebook PCs. Nvidia shifted its GeForceFX 5200 and 5600 cores into the mobile market, improving the video core while using new power-management techniques to reduce power consumption. ATI, meanwhile, is expected to announce its Mobility Radeon 9600. Both of the Nvidia and ATI announcements capitalize on the sudden interest in notebook applications, prompted by the launches of the Intel Centrino and the AMD Athlon XP-M processors on Wednesday. Nvidia has also succeeded into pushing its GeForceFX into the high-end and mainstream segments in both the desktop and notebook markets in just over 100 days." MacResQ has announced the launch of a unique new nationwide repair service for Power Mac and iMac computers. The service, known as PowerMacResQ, will provide Mac users throughout the United States with a source for 24-hour repairs on their computers. PowerMacResQ is the only service of its kind offering 24-hour turnaround on repairs and nationwide, overnight pickup & delivery from the user's location. The service eliminates the extended delays and headaches frequently associated with trying to get Macs repaired locally. If a local repair center is available, costs are usually high and turnaround time is unacceptable for users who rely on their Macs on a daily basis. "PowerMacResQ is the perfect compliment to our highly successful PowerBookResQ program that we launched in 2002," said Shannon Jean, President of MacResQ. "PowerMac users will now be able to experience the same award-winning service that PowerBook users have come to rely on with PowerBookResQ." The PowerMacResQ program offers fast, safe, and reasonably priced repairs for PowerMac owners. Customers start by visiting PowerMacResQ.com or calling the toll-free number, 1-866-Mac-Repair. After just a few questions, MacResQ dispatches a custom-designed "PowerBox", built to insure safe transit for all PowerMacs and iMacs, via overnight courier to the customer. Upon receipt of the empty PowerBox, the customer simply slides their PowerMac into the container and attaches a preprinted shipping label. A quick, toll-free phone call brings a courier to the customer's location for overnight shipping back to MacResQ's service center. A MacResQ technician conducts a thorough diagnosis and contacts the customer with a detailed repair estimate. The repair is then completed within one business day and the PowerMac is returned to its owner via overnight service. The cost of the PowerMacResQ program is just $129. This includes the 3-way overnight shipping, the initial diagnostic service, and the PowerBox, which the customer may keep for future use. "During the past ten years, our technicians have repaired more than 50,000 Power Mac and iMac systems," said Jean. "Through this extensive experience, we've developed exclusive processes that allow us to offer repairs in an unheard-of 24-hour time frame to meet the demands of Mac users everywhere." For computer resellers and repair centers, PowerMacResQ offers discounted rates on products and services. Computer dealers can send overflow service work or seamlessly outsource their entire PowerMac repair operation. Asante Technologies, Inc. has announced significant pricing actions on its comprehensive line of gigabit ethernet switches and adapters. "As file and disk drives increase in size, demand for faster network speeds has grown dramatically," says Jim Hsia, Asante Vice President of Marketing. "These new prices on FriendlyNET GX5 switches have made gig even more affordable to small- and medium-sized businesses. By using the latest silicon designs, Asante has engineered these products at breakthrough prices. We're pleased to pass on these savings to our customers to make upgrading their networks an easy decision." Asante offers higher-performance GigaNIX adapters optimized for the 64-bit PCI bus inside Apple Mac OS X, Microsoft Windows 2000, and Linux/Unix servers. For organizations and workgroups are upgrading from fast ethernet to gigabit ethernet, Asante's FriendlyNET GX5-208 is the ideal switch. This dual gigabit switch features eight 10/100 ports to connect legacy device that don't require 1000 Mbps throughput. Priced at $299, it's less than $30 per port. Two years ago, Asante's 4-port gigabit switch was priced at $1,199; today, the GX5-400 is priced 67% lower - just $399 ($99/port). The popular 8-port GX5-800 is ideal for digital design professionals. It's now priced at $599 ($75/port). "With gigabit ethernet becoming so popular, network administrators and users want more gig ports at an affordable price," Hsia continued. "The GX5-1300, GX5-1600, and GX5-2400 switches deliver 13, 16, and 24 ports of gigabit ethernet in just 1 rack unit (RU) high form factor." There are two different versions of WallStreet running at 233 MHz, the cacheless MainStreet version and the later Series II with a level 2 cache. It's not always possible to determine from the vendor's listing which is being offered, so we've included links within this paragraph to the two models. 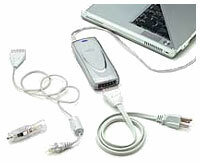 The same goes for the PowerBook G4/667 (Gigabit Ethernet/2001) and G4/667 (DVI). PowerBook Pismo G3/500, 128/12/DVD, $1099.99. For more deals on current or recently discontinued models, see our Best PowerBook G4 Deals and Best iBook Deals.